It all began in 1979 when Jim George noticed the growing popularity of the gold nail charms and diamonds being used by his wife and cosmetologist Charlene. Working as a team with a jeweler, the Georges founded Nail Fashions selling nail jewelry. The birth of International Nail Manufacturers (INM) in 1987 evolved to meet the growing demands of nail technicians for better quality products, more choices, and reasonable prices. INM’s first major breakthrough product, which remains the number-one selling professional top coat today, is Out-The-Door. Nothing dries faster or prevents polish cracking and chipping like Out-The-Door. Continuing its fine tradition of high caliber products, INM recently introduced the Out-The-Door Acrylic Sculpting System. “It took a great deal of time to develop an acrylic we felt met the needs of professionals, delivered the results clients demand, and could be proudly associated with the high caliber reputation of the Out-The-Door name,” says marketing director and Jim’s son Steve Tate. Based in Anaheim, Calif., the experienced professionals at INM work to blend technology with artistry in product development. From market research to advertising to the brand new website (www.inmnails.com), the INM staff are bringing a whole new look, feel, and appeal to the products and the company. Keeping it in the family, son-in-law David Kellenberger acts as sales manager. What started as a husband-and-wife team (Charlene passed away in 1994) now employs 50 people and sells products in more than 20 countries. Nail techs can expect great new products under the Out-The-Door brand name along with their other popular systems and products, including NOP (No Odor Acrylic), Juliette Natural Nail Wraps, Wrapped In Glass Fiberglass, and Northern Lights Hologram Topcoat. 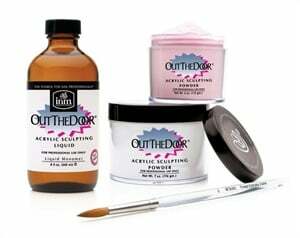 The Out the Door Acrylic Sculpting System features a cross-linking liquid and color clarity powder technology for a thin, durable acrylic coat that looks adn acts just like natural nails. INM elite educator Sara Rayna Holden shares an interesting way of keeping nail art inspiration close by.